No shirt, no shoes, no service…. But you might just be able to win an Olympic marathon. Minimalism burst onto the running scene with the publication of Born to Run in 2009, claiming that running barefoot was more natural and would lead to fewer injuries. Since then, the scientific community has been working at catching up, testing to see which claims hold up to scrutiny and which don’t. It takes the scientific community some time to do their work, so we decided to look at how people’s interest in barefoot running preceded the scientific community’s ability to study it. 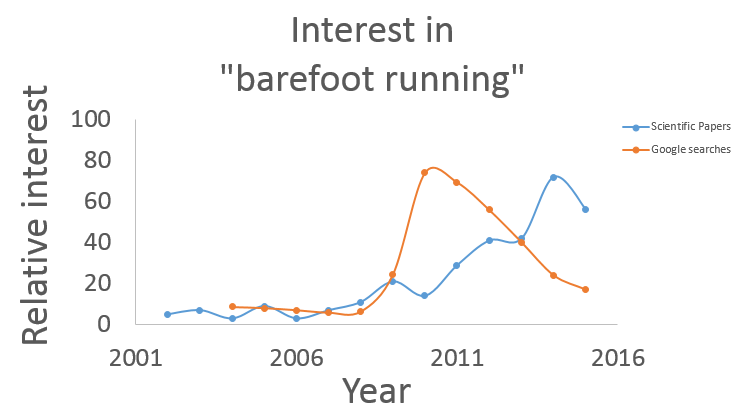 So we gauged people’s interest by looking at Google search trends for the phrase “barefoot running”, and found it peaked in 2010. Publications on Web of Science (which only indexes scientific papers) peak in 2014. I kind of suspect if you did a similar analysis for “Atkins diet” you’d probably find something similar. It takes the scientific community time to catch up to all the claims made in the popular press. So what have scientists found? Well so far it looks like running in minimalist shoes or barefoot doesn’t guarantee you’ll switch to a forefoot landing gait, and while you might get fewer hip or knee injuries, you’ll increase your rate of foot and ankle injuries.